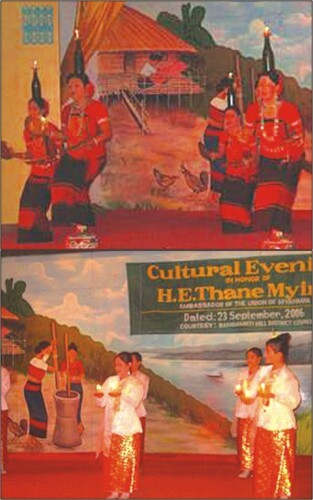 Rangamati Hill District Council (RHDC) recently organised a cultural evening to honour the visiting ambassador of the Union of Myanmar, Thane Myint at the local Tribal Culture Institute (TCI) auditorium. Indigenous artistes of the Chakma, Marma, Tangchangya, Tripura and Lusai communities performed songs and traditional dances at the event. Dancers of the Marma community performed a "Candle dance", balancing lit candles set on small plates on their palm. This was followed by a "Bamboo dance" performed by artistes of the Lusai community. Suchanda Tangchangya performed a love song titled O-re-o-baier-an, jare-tuiparandare-koidegoina. Aungthoai Marma and Subhadra Tripura performed tradition songs while Kalayan Chakma and Shila Chakmsa performed a duet song. Chakma artistes also performed a traditional "Bizu dance." The Chakma community celebrates "Bizu Utsab," ushering in the New Year at the end of Bangla month of Choitra. Tripura artistes wrapped up the programme with a "Bottle dance". Earlier, ambassador Thane Myint visited the museum of TCI and admired the collection of different traditional items.